With more than 35 year’s experience selling toys to millions of families throughout the UK, there’s not much The Entertainer don’t know about what children want! The Entertainer are experts in what kids love and their winning combination of fair prices, great special offers and excellent customer service means they’re a favourite with mums and dads too. 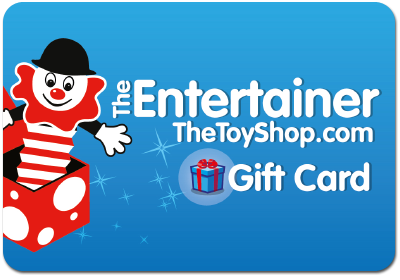 For full terms and conditions and for details on how to register this eGift Voucher to safeguard the balance on it visit thetoyshop.com/giftcard. The Entertainer eGift Vouchers are issued by The Entertainer (Amersham) Limited, Boughton Business Park, Bell Lane, Little Chalfont, Bucks, HP6 6GL.